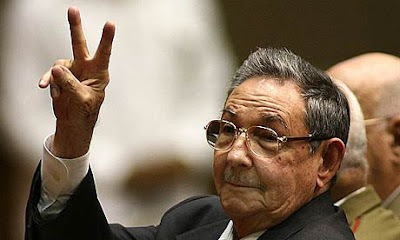 Cuban president Raul Castro at Cuba's National Assembly in Havana. Photo by Ismael Francisco /AFP/ Getty images. In 1992, a little over 19 years ago during one typical hot summer season in New York City as the calm was smothering midtown and Murray Hill and the lethargic heat made it almost impossible to lift even an Italian Ice, four guys jokingly referred to as the Four Riders of the Apocalypse conceived of a work plan to fill up those slow muggy afternoons. There really wasn’t much to do in those days; the first Gulf War was “over,” the sanctions were in place, Saddam Hussein was still president, and the Iraqi people were suffering the after-effects of war and would do so till this very day; the Israeli Palestinian conflict was still going to be an issue one way or another; Puerto Rico was not going to be an independent island (at least not yet); North Korea and Iran had not yet made a peep over nukes. Life was pretty slow in the UN. Well, for most, it was slow. There were those who called them crazy -- almost harebrained -- given the extreme circumstances and what they were up against. To others it was remarkable how this particular topic had never been put forth. Finally by the end of the summer, right as autumn was turning the Central Park leaves from green to the bright hues of auburn and yellow, they presented their plan to the largest world audience around, the United Nations. So it was that Resolution 59/11 of the United Nations General Assembly was adopted during the fall of the year 1992. The way UN resolutions work is pretty simple. A nation -- or a group of nations -- get together and present a draft resolution which is then voted upon by the entire body of the General Assembly in order to become a topic of each year’s GA agenda. If it receives enough votes, it continues on the agenda. Not very complicated, pretty straight forward, really not rocket science. As far as the rules and the regulations of the UN charter are concerned, member states have rights and responsibilities. One of the responsibilities is to adhere to the democratic voting process of the organization, its Charter, and its Security Council -- whichever the case may be. The United States of America is a founding member of both the General Assembly and the Security Council and has used both privileges on many occasions. For almost two decades now, in what appeared to be a slow rise at first and has now become unwavering, the General Assembly has been voting in favor of resolution 59/11. Each year, gaining votes in favor, and losing abstentions with the same two nations voting against. This year, the vote on resolution 59/11 on October 26th was once again described by the media as “an overwhelming majority” in favor of the resolution. Of the 192 member states that make up the entire body of the United Nations, 187 voted in favor of the resolution, Two -- Israel and the United States -- voted against it. And here is the punch line for geography buffs: the Marshall Islands, Palau, and Micronesia decided to abstain. Resolution 59/11 is entitled “Necessity of ending the economic, commercial and financial embargo imposed by the United States of America against Cuba.” This is basically a fancier and nicer way of stating the following: put an end to the U.S. embargo against Cuba. This is a legislated issue within the United States and thus does not fall automatically in the hands of the president. It isn’t President Obama’s embargo. Technically it belongs to Congress. Under law the only way the U.S. embargo against Cuba can be lifted is if two-thirds of the United States Congress (both houses) vote to do so. This has been a given since President William Clinton signed the Helms Burton Bill into law in 1996 serving at the pleasure of the Cuban American National Foundation and a few legislators. It’s not President Barack Obama's Embargo; it belongs to Congress and to the voters in the United States. The irony is that Cuba is a Third World nation which has never had -- and has never expressed -- any intent of harming the people of the United State. Though unable to acquire practically anything on the open world market, this island has managed to achieve a 78-year life expectancy rate and an infant mortality rate at birth that would be the envy of any First World nation. This is even more interesting if you take into account that the embargo has been around as long as the Cuban Revolution, so the “punishment” was not inflicted because of anything Cuba did or did not do to the United States or anyone else, but rather as a response to its sheer existence: radical social change 90 miles off the coasts of Florida. So, I must ask the readers of The Rag Blog to urge the current President to advise his Congress (and yours) to lift this unjust, insane, ludicrous, and internationally condemned policy that is leading nowhere. Those Four Riders of the Apocalypse didn’t spend their summer months writing in vain. Don’t let this president become the eleventh administrative head responsible for yet another year of unjust punishment of Cuba -- for its simple desire for independence and sovereignty, something the forefathers of your own great nation also achieved through that “evil” word: revolution.